This article is about the console released in 2006. For its successor, see Wii U. The Wii (/wiː/ wee) is a home video game console which was released by Nintendo on November 19, 2006 in North America, December 2, 2006 in Japan, December 7, 2006 in Australia, and on December 8, 2006 in Europe. As a seventh-generation console, the Wii competed with Microsoft's Xbox 360 and Sony's PlayStation 3. Nintendo states that its console targets a broader demographic than that of the two others. As of the first quarter of 2012[update], the Wii leads its generation over PlayStation 3 and Xbox 360 in worldwide sales, with more than 101 million units sold; in December 2009, the console broke the sales record for a single month in the United States. The Wii introduced the Wii Remote controller, which can be used as a handheld pointing device and which detects movement in three dimensions. Another notable feature of the console is the now defunct WiiConnect24, which enabled it to receive messages and updates over the Internet while in standby mode. Like other seventh-generation consoles, it features a game download service, called "Virtual Console", which features emulated games from past systems. It succeeded the GameCube, and early models are fully backward-compatible with all GameCube games and most accessories. Nintendo first spoke of the console at the E3 2004 press conference and later unveiled it at E3 2005. Nintendo CEO Satoru Iwata revealed a prototype of the controller at the September 2005 Tokyo Game Show. At E3 2006, the console won the first of several awards. By December 8, 2006, it had completed its launch in the four key markets. In late 2011, Nintendo released a reconfigured model, the "Wii Family Edition", which lacks Nintendo GameCube compatibility; this model was not released in Japan. The Wii Mini, Nintendo's first major console redesign since the compact SNES, succeeded the standard Wii model and was released first in Canada on December 7, 2012. The Wii Mini can only play Wii optical discs, as it omits GameCube compatibility and all networking capabilities; this model was not released in Japan, Australia, or New Zealand. The Wii's successor, the Wii U, was released on November 18, 2012. On October 20, 2013, Nintendo confirmed that it had officially discontinued production of the Wii in Japan and Europe, although the Wii Mini is still in production and available in Europe. The Nintendo DS is said to have influenced the Wii's design. Designer Ken'ichiro Ashida noted, "We had the DS on our minds as we worked on the Wii. We thought about copying the DS's touch-panel interface and even came up with a prototype." The idea was eventually rejected because of the notion that the two gaming systems would be identical. Miyamoto also stated, "[...] if the DS had flopped, we might have taken the Wii back to the drawing board." In June 2011 Nintendo unveiled the prototype of its successor to the Wii, to be known as Wii U. The console was known by the code name "Revolution" until April 27, 2006, immediately before E3. Nintendo has stated that the official plural form is "Wii systems" or "Wii consoles." The Nintendo Style Guide refers to the console as "simply Wii, not Nintendo Wii", making it the first home console Nintendo has marketed outside Japan without the company name in its trademark. On September 14, 2006 Nintendo announced release information for Japan, North and South America, Oceania, Asia and Europe including dates, prices, and projected unit-distribution figures. It was announced that the majority of the 2006 shipments would be allotted to the Americas, and 33 titles would be available at its launch. The Wii was launched in the United States on November 19, 2006 for $249.99, and was later launched in the United Kingdom on December 8, 2006 for £179. The United Kingdom experienced a widespread shortage of Wii units in many High-Street and online stores, and was unable to fulfill all pre-orders at its release. The Wii was launched in South Korea on April 26, 2008 and Taiwan on July 12, 2008. Retail copies of games are supplied on proprietary, DVD-type Wii optical discs, which are packaged in keep cases with instructions. In Europe, the boxes have a triangle at the bottom corner of the paper sleeve-insert side. The triangle is color-coded to identify the region for which the title is intended and which manual languages are included. The console supports regional lockout (software purchased in a region can be only played on that region's hardware). The Virtual Console service allows Wii owners to play games originally released for the Nintendo Entertainment System, Super Nintendo Entertainment System, Nintendo 64, Sega's Genesis/Mega Drive and Sega Mark III/Sega Master System, NEC's TurboGrafx-16/PC Engine, SNK's Neo Geo console, Commodore 64 and arcade games. Virtual Console games are distributed over broadband Internet via the Wii Shop Channel, and are saved to the Wii internal flash memory or to a removable SD card. Once downloaded, Virtual Console games can be accessed from the Wii Menu (as individual channels) or from an SD card via the SD Card Menu. There is also a Wii homebrew community, dedicated to creating and playing content unendorsed by Nintendo. 919.07 million Wii games have been sold worldwide as of September 30, 2017[update], and 104 titles had surpassed the million-unit mark by March 2011. The most successful game (Wii Sports, which comes bundled with the console in most regions) sold 82.83 million copies worldwide by September 2017, surpassing Super Mario Bros. as the best-selling game of all time. The best-selling unbundled game, Mario Kart Wii, had sold 37.02 million units. ↑ Wii Sports came bundled with the Wii in all territories except Japan and South Korea. The front of the console features an illuminated slot-loading optical media drive which accepts only 12 cm Wii Optical Discs and 8 cm Nintendo GameCube Game Discs. (Units sold in South Korea and later revisions do not support GameCube discs.) The blue light in the disc slot illuminates briefly when the console is turned on, and pulses when new data is received through WiiConnect24. After the update (including System Menu 3.0), the disc-slot light activates whenever a Wii disc is inserted or ejected. When there is no WiiConnect24 information, the light stays off. The disc-slot light remains off during game play or when using other features. Two USB ports are located at its rear. An SD-card slot is located behind the cover on the front of the console. The disc reader of the Wii does not play DVD-Video, DVD-Audio or Compact Discs. A 2006 announcement stated that a new version of the Wii (capable of DVD-Video playback) would be released in 2007; however, Nintendo delayed its release to focus on meeting demand for the original console. Nintendo's initial announcement stated that it "requires more than a firmware upgrade" to implement, and the capability could not be made available as an upgrade option for the existing Wii. Despite this assertion, third parties have used Wii homebrew to add DVD playback to unmodified Wii units. The Wii also can be hacked to enable an owner to use the console for activities unintended by the manufacturer. Several brands of modchips are available for the Wii. Although Nintendo showed the console and the Wii Remote in white, black, silver, lime-green and red before it was released, it was only available in white for its first two-and-a-half years of sales. Black consoles were available in Japan in August 2009, in Europe in November 2009 and in North America on May 9, 2010. A red Wii system bundle was available in Japan on November 11, 2010, commemorating the 25th anniversary of Super Mario Bros. The UK version of the limited-edition red Wii was released October 29, 2010, preloaded with the original Donkey Kong game. It also featured the Wii Remote Plus, a new version of the controller with integrated Wii Motion Plus technology. 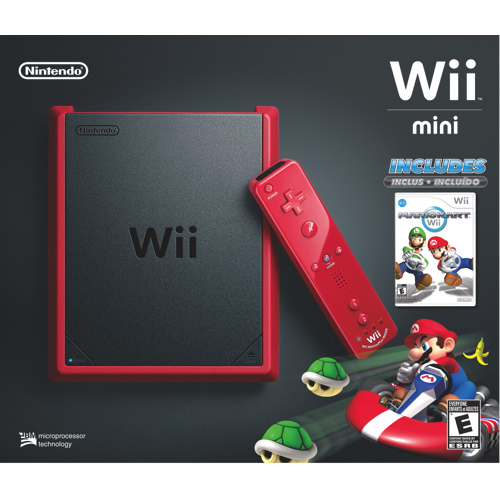 The red Wii bundle was released in North America on November 7, 2010 with New Super Mario Bros. Wii and the Wii Remote Plus. The Wii console contains 512 megabytes of internal flash memory, and features an SD card slot for external storage. An SD card can be used for uploading photos and backing up saved game data and downloaded Virtual Console and WiiWare games. To use the SD slot for transferring game saves, an update must be installed. Installation may be initiated from the Wii options menu through an Internet connection, or by inserting a game disc containing the update. Virtual Console data cannot be restored to any system except the unit of origin. An SD card can also be used to create customized in-game music from stored MP3 files (as first shown in Excite Truck) and music for the slide-show feature of the Photo Channel. Version 1.1 of the Photo Channel removed MP3 playback in favor of AAC support. At the Nintendo Fall Press Conference in October 2008, Satoru Iwata announced that Wii owners would have the option to download WiiWare and Virtual Console content directly onto an SD card. The option would offer an alternative to "address the console's insufficient memory storage". The announcement stated that it would be available in Japan in spring 2009; Nintendo made the update available on March 25. In addition to the previously announced feature, it lets the player load Virtual Console and WiiWare games directly from the SD card. The update allows the use of SDHC cards, increasing the limit on SD card size from 2 GB to 32 GB. While the Wii Remote had attracted a number of patent infringement lawsuits, the Wii console and other accessories were also the focus of lawsuits. A Texas-based company (Lonestar Inventions) sued Nintendo, claiming that the company copied one of Lonestar's patented capacitor designs and used it in the Wii console. The two companies agreed to dismiss all claims by July 2009, alongside a settlement made between Lonestar and AMD, which provided Nintendo's microprocessor technology; whether the Lonestar-Nintendo dismissal included any out-of-court settlement terms was not clear. Anascape Ltd, a Texas-based firm, filed a lawsuit against Nintendo for patent infringement regarding the vibrational feedback used by Nintendo's controllers. A July 2008 verdict banned Nintendo from selling the Classic Controller in the United States, in addition to the GameCube and Wavebird controllers. Following an appeal to the U.S. Court of Appeals for the Federal Circuit, on April 22, 2010 the Federal Circuit Court ruled in Nintendo's favor. The Wii Menu interface is designed to emulate television channels. Separate channels are graphically displayed in a grid, and are navigated using the pointer capability of the Wii Remote. Except for the Disc Channel, it is possible to change the arrangement by holding down the A and B buttons to "grab" channels and move them around. There are six primary channels: the Disc Channel, Mii Channel, Photo Channel, Wii Shop Channel, Forecast Channel and News Channel. The latter two were initially unavailable at launch, but were later activated in updates. The Wii + Internet Video Channel was installed in consoles manufactured after September 2008. Additional channels are available for download from the Wii Shop Channel through WiiWare, and appear with each Virtual Console title; these include the Everybody Votes Channel, Internet Channel, Check Mii Out Channel and the Nintendo Channel. As of October 18, 2010[update], Wii owners can download the Netflix Channel from the Wii Shop Channel. A Wii console running a GameCube disc is restricted to GameCube functionality, and GameCube controller is required to play GameCube titles. A Nintendo GameCube Memory Card is also necessary to save game progress and content, since the Wii internal flash memory will not save GameCube games. Also, backward compatibility is limited in some areas. For example, online and LAN-enabled features for Nintendo GameCube titles are unavailable on the Wii, since the console lacks serial ports for the Nintendo GameCube Broadband Adapter and Modem Adapter. The Wii console connects to the Internet through its built-in 802.11b/g Wi-Fi or through a USB-to-Ethernet adapter; either method allows players to access the Nintendo Wi-Fi Connection service. The service has several features for the console, including the Virtual Console, WiiConnect24, Internet Channel, Forecast Channel, Everybody Votes Channel, News Channel and the Check Mii Out Channel. The Wii can also communicate (and connect) with other Wii systems through a self-generated wireless LAN, enabling local wireless multi-playing on different television sets. Battalion Wars 2 first demonstrated this feature for non-split screen multi-playing between two (or more) televisions. On April 9, 2008, the BBC announced that its online BBC iPlayer would be available on the Wii via the Internet Channel browser; however, some users experienced difficulty with the service. On November 18, 2009, BBC iPlayer on the Wii was relaunched as the BBC iPlayer Channel, a free download from the Wii Shop Channel; however, the service is only available to people in the United Kingdom. On December 26, 2008, Nintendo announced a new video channel for the Wii. As of October 18, 2010[update], American and Canadian Wii owners can watch Netflix instantly on a channel (without requiring a disc). At the same time, criticism of the Wii Remote and Wii hardware specifications has surfaced. Former GameSpot editor and Giantbomb.com founder Jeff Gerstmann stated that the controller's speaker produces low-quality sound, while Factor 5 President Julian Eggebrecht criticized the hardware audio as substandard for a console of its generation. UK-based developer Free Radical Design stated that the Wii hardware lacks the power necessary to run the software it scheduled for release on other seventh-generation consoles. Online connectivity of the Wii was also criticized; Matt Casamassina of IGN compared it to the "entirely unintuitive" service provided for the Nintendo DS. Game designer and The Sims creator Will Wright shared his thoughts on the Wii in the context of the current console generation: "The only next gen system I've seen is the Wii – the PS3 and the Xbox 360 feel like better versions of the last, but pretty much the same game with incremental improvement. But the Wii feels like a major jump – not that the graphics are more powerful, but that it hits a completely different demographic." By 2008, two years after the Wii's release, Nintendo acknowledged several limitations and challenges with the system (such as the perception that the system catered primarily to a "casual" audience and was unpopular among "core" gamers). Game designer Shigeru Miyamoto admitted that the lack of support for high definition video output on the Wii and its limited network infrastructure also contributed to the system being regarded separately from its competitors' systems, the Xbox 360 and PlayStation 3. The Globe and Mail, in suggesting why Nintendo posted a record loss of $926 million for the initial six months of its 2011–2012 fiscal year, blamed the Wii's design for being "short-sighted". The Wii initially enjoyed phenomenal success because it was inexpensive (due to its being less sophisticated than its competitors) and introduced a "gaming gimmick". However, this approach meant that the Wii's hardware soon became outdated and could not keep up long-term (in contrast to more-advanced rivals such as Xbox 360 and PlayStation 3, which are expected to continue doing well in 2012–2013) "as both user desires and surrounding technologies evolved" later in the generation. Furthermore, price cuts and the introduction of motion-sensor controllers for the Xbox 360 and PS3 nullified advantages once held by the Wii. The Globe suggested that there were other reasons for Nintendo's poor financial performance, including a strong yen and a tepid reception to the Nintendo 3DS handheld as mobile gaming becomes popular on smartphones and tablets (such as the iPad). Since its launch, monthly sales numbers of the console have generally been higher than its competitors around the globe. According to the NPD Group, the Wii sold more units in the United States than the Xbox 360 and PlayStation 3 combined in the first half of 2007. This lead is even larger in the Japanese market, where it currently leads in total sales (having outsold both consoles by factors of 2:1 to 6:1 nearly every week from its launch to November 2007). In Australia the Wii broke the record set by the Xbox 360 and became the fastest-selling game console in Australian history, selling 32,901 units within the first four days of the console’s release. It also broke the 360’s Australian record for the quickest amount of time to sell 100,000 units, reaching the milestone within six months and two weeks. On September 12, 2007, the Financial Times reported that the Wii had surpassed the Xbox 360 (released a year earlier) and had become market leader in home-console sales for the current generation, based on sales figures from Enterbrain, NPD Group and GfK. This was the first time a Nintendo console led its generation in sales since the Super Nintendo Entertainment System. In the United States the Wii sold 10.9 million units by July 1, 2008, making it the leader in current-generation home console sales according to the NPD Group (and surpassing the Xbox 360). In Japan the Wii surpassed the number of GameCube units sold by January 2008; it sold 7,526,821 units by December 2008, according to Enterbrain. According to the NPD Group the Wii surpassed the Xbox 360 to become the best-selling "next-generation" home video-game console in Canada (with 813,000 units sold by April 1, 2008), and was the best-selling home console for 13 of the previous 17 months. According to the NPD Group the Wii had sold a total of 1,060,000 units in Canada by August 2008, making it the first current-generation home console to surpass the million-unit mark in that country. In the United Kingdom the Wii leads in current-generation home-console sales with 4.9 million units sold as of January 3, 2009[update], according to GfK Chart-Track. On March 25, 2009 at the Game Developers Conference, Satoru Iwata said that worldwide shipments of Wii had reached 50 million. According to GfK Australia, the Wii had sold over 500,000 units in Australia within 84 weeks of its release, beating the PlayStation 2 and the DS as the fastest system to accumulate 500,000 sales in that country. On September 23, 2009, Nintendo announced its first price reductions for the console. Nintendo sold more than three million Wii consoles in the U.S. in December 2009 (setting a regional record for the month and ending nine months of declining sales), due to the price cut and software releases such as New Super Mario Bros. Wii. On January 31, 2010 the Wii became the best-selling home video-game console produced by Nintendo, with sales of over 67 million units (surpassing those of the original Nintendo Entertainment System). Nintendo reported that on Black Friday 2011 over 500,000 Wii consoles were sold, making it the most successful Black Friday in company history. The Wii Family Edition variant is identical to the original model, but is designed to sit horizontally (the vertical feet are still present; however, the front labels are rotated and a stand is no longer included) and removes the GameCube controller and memory card ports, although the casing under the top cover still has the GameCube controller and memory card ports holes with no ports and no slots. For this reason, the Family Edition variant is incompatible with GameCube games and accessories. The console was announced on August 17, 2011 and released in Europe and North America in October 2011. The Wii Family Edition was made available in Europe, bundled with a Wii Remote Plus, Wii Party and Wii Sports. A blue Wii Family Edition was launched to coincide with Black Friday and the release of Mario & Sonic at the London 2012 Olympic Games on November 18, 2011 and a black Wii Family Edition (bundled with New Super Mario Bros. Wii and the official soundtrack CD of Super Mario Galaxy) was released on October 23, 2011. In late 2012 Nintendo released a version of the North America black edition, including Wii Sports and Wii Sports Resort games on a single disc instead of the New Super Mario Bros. Wii game and the Super Mario Galaxy soundtrack. The Wii Mini (stylized as Wii mini) is a smaller, redesigned Wii with a top-loading disc drive. This model lacks YPBPR (component video/D-Terminal), S-Video, RGB SCART output, GameCube compatibility, online connectivity, the SD card slot and Wi-Fi support, and has only one USB port unlike the previous models' two. The initial release omitted a pack-in game, but Mario Kart Wii was included at no extra charge beginning on September 18, 2013 in Canada and from launch in the United States. It was released in Canada on December 7, 2012 with a MSRP of C$99.99, in Europe on March 22, 2013, and in the United States on November 17, 2013. Nintendo uses this console and the Nintendo Selects game series to promote low-cost gaming. The Wii Mini is styled in matte black with a red border, and includes a red Wii Remote Plus and Nunchuk. A composite video/audio cable, wired sensor bar and power adapter are also included. It was not released in Japan, Australia and New Zealand. Nintendo announced the successor to the Wii, Wii U, at the Electronic Entertainment Expo 2011. The Wii U features a controller with an embedded touch screen and output 1080p high-definition graphics; it is fully backward-compatible with Wii games and peripherals for the Wii. The Wii remote, Nunchuk controller and balance board are compatible with Wii U games which include support for them. The Wii U was released on November 18, 2012 in North America, November 30, 2012 in Europe and Australia, and December 8, 2012 in Japan. ↑ Nintendo's America Summer Line-up. IGN. Retrieved May 22, 2007. ↑ Wii operations manual: system setup, page 28. ↑ "Free Radical Design FAQ". Archived from the original on December 14, 2007. <templatestyles src="Module:Citation/CS1/styles.css"></templatestyles> frd.co.uk. Retrieved March 8, 2007. ↑ Casamassina, Matt (January 24, 2007). N-Query. IGN. Retrieved January 27, 2007. ↑ Research Shows Rehabilitation Benefits of Using Nintendo Wii Newswise. Retrieved September 28, 2008. This page was last modified on 3 November 2018, at 21:57.